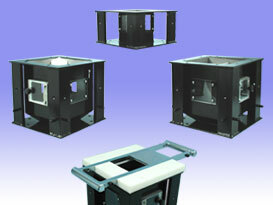 Our 10" x 10" Standard Base unit provides a solid foundation for any size feeder. Feed up to four additives using one base unit. Our Adjustable Regrind Base has a unique web design with adjustable baffles which directs and controls natural material flow, allowing for unrestricted metering of colorant pellets and regrind for optimal blending uniformity. Accu-Feed's 100% Regrind Base is perfect when running regrind through your virgin hopper. In addition, we offer an optional No Leak Base Unit Slide Assembly.